Cups of Fashion: I'm A Conan Apprentice! It's weird! I'm a girl, but really like Detective Conan comics. I want to be detective someday, yeah detective! I don't know what, but I always hypothesized when reading Conan's. And I often guess right in every crime. I always feel great when successfully solved a case. Eits, it's not easy, it takes a lot of logic to be able to analyze something, hihih. Btw, Conan have many series (now still vol. 57 and and it's not over). So sad, I only have about, ummm, 32 comics (if I not forgetting :p). Anyway, I always adore him. Yup, he is Aoyama Gosho! The great writers of Detective Conan comics, u're so amazing! Btw, this is my collection of Detective Conan's comics, just have vol 10-35, and some special editions, hehe. For any info about Detective Conan comics, u can read again my very oooold post about Shinichi Kudo (the main character in this comics). Click and read my article ! Say hello to my new bags! 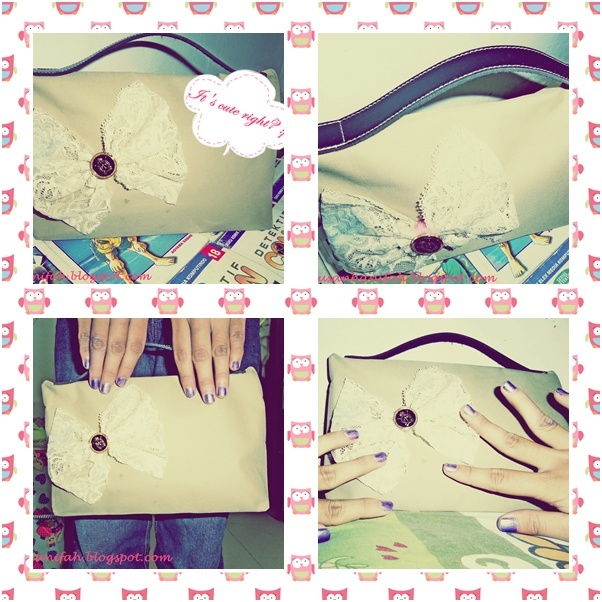 Yes, I make over my old bags, with a cute lace and old buttons. It's cute, right?